Cleaning is critical to the final hardwood floor finish. My Affordable Floors’ talented experts will remove nearly every speck of dust from the floor surface using our high-tech vacuums. We’ll prepare the surface using techniques developed over our decades of hardwood floor refinishing. Homeowners that know the importance of cleaning before refinishing can do their best, but rarely are able to clean as effectively as My Affordable Floors, leading to a less smooth final finish, and a frustrating application process. Once the floor is cleaned, our experts will apply the finish with a delicate touch that only experience can bring. The final product is a glass-like finish that brings out the fine details in your hardwood planks and adds a breathtaking beauty to your room. When you call My Affordable Floors to refinish your hardwood floors, there’s no deciding how many coats you need or how long to let it cure, our experts will apply the right amount of finish in the right way to ensure that your floor lasts for many years to come. We even offer UV floor finishing, giving you a super-durable, 100% cured finish in minutes, as opposed to the days required for a typical finish to cure. Once your My Affordable Floors hardwood floor refinishing project is complete, you’ll know you did the right thing by leaving this to the experts. Your floors take more abuse than any other surface of your home, but also have the most potential to increase the beauty of your living spaces. Don’t take a chance by doing it yourself, call the experts at My Affordable Floors today! My Affordable Floors is your hardwood floor refinishing experts in Milwaukee! Call us today at 262-653-1120 for a free, no-obligation estimate, or fill out our contact form to schedule a free, in-home visit. Hardwood floor refinishing is a messy, tedious, and time-consuming process. Many a DIY-er has attempted this project with the intention of saving money over professional hardwood floor refinishing, only to total up receipts at the end of the long and difficult project to see that they spent just as much money doing it themselves as they could have by hiring a professional. This doesn’t even take into account the value of their time, and the fact that a floor refinished by a pro is more durable, more beautiful, and leaves a much less dusty house than one that is refinished by most homeowners themselves. In Milwaukee, this is a job you should trust to the pros at My Affordable Floors. This first step is where things typically go wrong for the DIY homeowner. A common scenario plays out when a new homeowner pulls up carpeting to reveal hardwood below, and then goes to work removing the carpet completely. He or she then rents a floor sander, deciding on either a belt sander, which can be difficult to get the hang of and could result in floor damage, or an orbital sander, which is easy to use but less effective. After the first few attempts at sanding the old finish off result in quickly clogged sandpaper, the homeowner realizes he or she will need to strip the old finish, then sand, and then refinish. Costs are quickly piling up, the homeowner wishes he or she would have hired a pro, and we haven’t even got to the dusty part yet. My Affordable Floors has over two decades of experience as professional floor refinishers serving the Wisconsin/Illinois area, and we’re proud of our company’s reputation for providing affordable, high-quality hardwood floor refinishing services. We’ve seen it all, and we can quickly identify the best way to remove existing finish and get it done right, quickly and effectively. Our Ultra-efficient HEPA vacuums remove 95% of dust from the air as we sand, leaving your house nearly spotless when the job is complete. This aspect of our service simply can’t be matched by a homeowner with a shop vac; do it yourself and get ready to dust your home daily for weeks. When it comes to fixing imperfections in existing flooring, we’re on top of it. We’ll find the old dents and dings in the flooring, old cuts from carpet knives, and water damage, and repair it at this critical stage of the refinish job. Most DIY-ers would miss many of these imperfections in the sanded flooring, and only see them after the finish is applied, leading to a real head-slapping moment. In our next post, we’ll continue our guide to hardwood floor refinishing with floor preparation and applying the finish. If you have considered the options, consulted with an expert, and done your research, chances are you may have decided that hardwood flooring is your preferred flooring material for your project. Once installed, you should expect to have an extremely attractive floor that will last a lifetime with proper care. Keep in mind that perhaps the most important step of your decision is choosing quality hardwood flooring installation. A good installer can mean the difference between an easy to care for and long lasting floor, or squeaky, uneven, and/or crooked floorboards that will eventually require replacement. Fortunately, there are some clear signs to look for in an installer that will almost guarantee you are getting what you pay for. When you choose My Affordable Floors for your hardwood flooring installation in Milwaukee and the surrounding areas, you’ll notice these items are met and exceeded. A quote is not an itemized list of approximately what you’ll be paying for installation, it’s a legally binding document that should spell out in detail exactly what will be done, and exactly what the costs are for each item and task. This includes preparation, installation, and finishing. If your quote is missing any of these items, you may want to reconsider your installer. If flooring materials aren’t acclimated to the environment in which they will be installed, the material can expand or contract, or otherwise become malformed after installation. An experienced installer knows that this process is critical to installation, and can vary in different climates and at different times of the year. The installer should take moisture measurements and advise on how to properly acclimate the material. 3. Measure, calculate and prepare the layout. Since rooms are rarely a perfect square, your installer needs to spend considerable time planning before beginning work on the floor. Be sure to discuss the proper direction of the floorboards and agree on what needs to be done around any doorways, stairs, vents, or other obstacles. The quote should provide details about the subfloor preparation that is required as well. Any old flooring will need to be removed and repairs to subfloor boards made to ensure the new flooring is fastened to a flat, level, clean, dry, and completely rigid substrate. The installer will apply the appropriate underlayment over the subfloor, which helps to regulate air and moisture movement and extends the life of the flooring material. Another error that can significantly reduce the expected lifespan of your floor is improper fastening. Make sure your installer specifies that appropriate nails will be used, and in what locations on each floorboard. For most installations, the installer will use a pneumatic flooring nailer, and attach each board with several nails, ensuring that the ends are firmly nailed in place to avoid loosening and movement over time. Are you interested in hardwood flooring for your home? My Affordable Floors will exceed these expectations for our installation services, guaranteed. Call us today at 262-653-1120 for a free, no-obligation estimate, or fill out our contact form to schedule a free, in-home visit. Vinyl flooring is popular not only because of its good looks and relatively low cost but also because of its long-lasting durability. Once your vinyl flooring installation is complete, you can expect a flooring surface that retains its appearance for years to come with minimal maintenance, even in high-traffic areas. However, all flooring types need regular cleaning to ensure they continue to look their best for as long as possible. Cleaning vinyl flooring is quite simple, but there are a few basic rules to follow to avoid damage. Abrasion of any kind can dull the surface of your flooring, or create tiny tears in the material that can result in more problems in the future. Before you clean your vinyl flooring with a mop and a cleaning solution, always sweep or vacuum to remove any sand, dust or dirt that could cause abrasion when pushed around on the surface. Also, remember to be careful of what cleaning supplies you use on your vinyl flooring, and avoid abrasive or sharp tools, as well as harsh cleaners or detergents. Be careful to always clean up spills immediately. Vinyl flooring is highly resistant to penetration, but some liquids can cause permanent staining, especially to lighter colored vinyl. It’s best to remove spills or leaks of all kinds as soon as possible. For everyday cleaning, you don’t even need to use detergent. Just a soft, damp mop will remove most of the dirt from your floor. For occasional deeper cleaning, it is best to use a gentle, non-abrasive floor cleaner, and avoid “mop and shine” products, which can leave a dull film on your flooring. Wet a soft mop, wring, and apply to the floor, rinsing often to remove dirt from the mop. As with any type of floor, never push, pull or drag furniture, appliances, or other items across the floor. Doing so can dent or otherwise permanently damage your vinyl flooring, requiring replacement. Vinyl flooring is easy to care for and adds beauty to your home. Are you interested in vinyl flooring installation in Milwaukee and the surrounding areas? Call us today at 262-653-1120 for a free, no-obligation estimate, or fill out our contact form to schedule a free, in-home visit. We’ll help you determine the right flooring for your home! The different types of flooring available to you all have their own advantages and disadvantages. Some types are are very durable but more expensive and time consuming to install. Other types offer a highly attractive look but require special care to maintain their appearance. 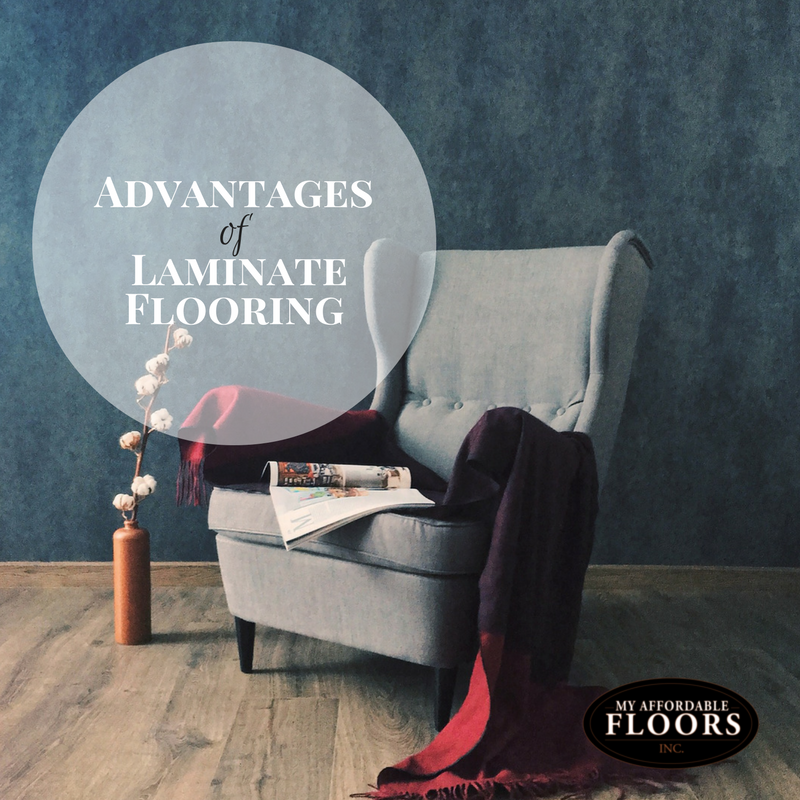 Of all the types of flooring available for your consideration, only laminate flooring can can claim to be not only inexpensive, but extremely durable, quick to install, and beautiful. For these reasons, laminate flooring is very popular, and My Affordable Floors offers easy and affordable laminate flooring installation services for your next project. Laminate flooring can cost less than half the cost of traditional hardwood flooring, and is considerably cheaper than carpet. Because of its ease of installation, laminate flooring can be installed with minimal disruption of your daily household life. The incredibly durable top surface layer of laminate flooring is resistant to stains, scratches and chips, and also doesn’t fade in sunlight. Best of all, the many patterns available in laminate flooring allow you to closely mimic the look of real wood flooring, giving you a rich look without the maintenance required by traditional hardwood. The maintenance of laminate flooring is easy – you simply vacuum or sweep and wipe with a damp cloth or mop! Laminate flooring has very few disadvantages, and luckily most of them can be avoided with some easy care. Owners of large dogs may want to consider laminate types with a high wear-resistance rating, and make sure to clip the dog’s claws regularly as they can gradually wear the top layer of the laminate. Also, it’s important to clean up spills quickly and avoid excess moisture on your laminate flooring, since moisture penetration can cause swelling and mildew. Unlike hardwood flooring, damaged laminate can’t be sanded or refinished – any damage will require planks to be replaced. Are you interested in laminate flooring for your home? Call us today at 262-653-1120 for a free, no-obligation estimate, or fill out our contact form to schedule a free, in-home visit. We’ll help you determine the right laminate flooring for your home! A well-cared for hardwood floor will provide a lifetime of beauty and enjoyment, but even the most careful homeowner will occasionally be faced with the need for hardwood floor repairs. An unnoticed water leak, an over-exuberant puppy, and an under-planned move of the piano are just a few of the common occurrences that can cause repairable damage to your floor. Let’s take a look at some common scenarios and the solutions offered by My Affordable Flooring. Damage caused by a burst pipe or leaky faucet can be disastrous, but is often more easily repairable than one would assume. The first step is to identify and repair the source of the water then take the necessary steps to ensure that the water leak can’t happen again. Once the source of the damage is repaired, it’s important to contact an expert to assess the level of damage and recommend a course of action for the repair. If the damage is limited to some simple finish peeling, slight discoloration, or mild floorboard warping (also called “cupping”), the flooring may be repairable with simple hardwood floor refinishing. The existing finish will be stripped or sanded away, and any discoloration or warping can often be sanded down to minimize or eliminate the damage. If the damage is too severe, board replacement may be necessary. In many situations, a section of boards can be replaced using the same types of hardwood flooring, and then the entire floor can be refinished to create a repaired floor that is as good as new. Any homeowner who has lived with hardwood flooring for a long time has felt the pain of accidentally dropping a sharp object or sliding a rough, heavy item and denting, scratching or gouging his or her beautiful floor. Luckily, these type of blemishes are frequently repairable as well. As long as the dent, scratch or gouge is no deeper than ⅛-inch, there is a reasonable chance that it can be repaired by sanding and finishing. Floor damage that is deeper than that, however, nearly always requires replacing the boards, then sanding and refinishing the entire floor. Homes of all ages often have holes in the hardwood flooring, possibly from staples and tacks from a previous carpet installation, or holes drilled to run telephone wires or cables for television. While board replacement and refinishing is the only way to completely remove all evidence of these holes, wood filler can often be used to mask the holes and make them much less apparent. The pros at My Affordable Floors have the experience necessary to expertly perform the best repair for your particular situation. Although many surface blemishes and shallow imperfections can be repaired relatively quickly by My Affordable Floors experts, extreme damage resulting from pet urine, major plant stains, and burns often require replacement of the boards and refinishing of the whole room. Since these repair and refinish jobs can be intrusive and expensive, it’s important to hire a professional with the experience and service necessary to do the job right. With My Affordable Floors, you get our 20+ years of experience, our exemplary customer service, and our quality equipment and materials, all at a affordable price. Ultraviolet (UV) curing provides a durable and environmentally-friendly floor-finishing solution. My Affordable Floors offers homes in Milwaukee, Chicago, and surrounding areas access to the best in UV floor-finishing services. Whether you own a business that needs quick results or you’re a homeowner starting a remodeling project with your floors, the professional UV floor-finishing services of My Affordable Floors is ready to work with you. In just a few short hours, you can have completely refinished floors that are 100% cured and ready for use. Keep liquids—especially puddles—away from your floor and make sure not to use too much liquid when cleaning. For proper cleaning, just use a damp mop or sponge. Don’t let shoes with spikes or “spike heels” to be worn on the floor, as these can indent the wood. Don’t wax your floor, as waxes can dull the finish. In fact, if you wax your floor, you may need to have the entire floor sanded down again and re-coated. If you’re considering hardwood flooring and are interested in UV curing, then give us a call. We offer free estimates and consultations for all of our services. Call our friendly sales associates today at 262-653-1120 for a no-obligation estimate or just complete our contact form to schedule your appointment. Hardwood flooring is experiencing a renaissance. There are so many perks to hardwood: durability, easy-cleaning, natural beauty. Many older homes already have hardwood flooring, but it’s often covered by carpet or laminate and in need of significant repair. The question is: are the repairs worth it? Or, is it smarter to simply replace the hardwood floors altogether? To give an old hardwood floor new life, you simply need to sand, stain, and finish it. Where it gets complicated: this can be a long, backbreaking, messy process. Further, it can be just as pricey as buying new. If you value the unique character of your home’s original hardwood, refinishing might be the right choice for you. That said, installing new product could save you time and hassle. By choosing to replace your hardwood floors instead of refinishing them, you can get a fresh start. Instead of dealing with the imperfections of existing hardwood, you can select the product that is perfect for your lifestyle, whether that’s aesthetic style or durability. My Affordable Floors is Milwaukee’s choice for hardwood floor refinishing and replacement services. If you need help deciding what to do with your home’s hardwood floors, or if you’re ready to get started, My Affordable Floors is ready to work with you. Call us today at 262-653-1120 for a free, no obligation estimate or just complete our contact form to schedule your appointment.